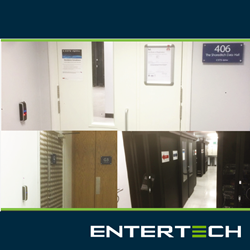 Today Entertech Systems shared the successful deployment of Suprema biometric hardware for access control at City Lifeline, a provider of data center colocation located in the heart of London’s tech city since 1993. Today Entertech Systems(TM) shared the successful deployment of Suprema biometric hardware for access control at City Lifeline, a provider of data center colocation located in the heart of London’s tech city. Entertech is the official operating partner of Suprema Inc., a global leader in biometrics and securities technology for the United States, Canada, United Kingdom, Ireland and Puerto Rico. With over 28,000 square feet and capacity for over 600 racks in the heart of London’s new Tech City Area, City Lifeline operates to Tier 3 standards of resilience and reliability. An impressive 24 carriers provide data communications to around 90 customers collocated with them. As a secure provider of shared data center space, City Lifeline needed to ensure they could reliably give their clients insights into the access of each area of their facility as well as provide enhanced levels of physical and data security. City Lifeline identified Entertech as a good fit in terms of their product, biometric knowledge and internationally available support team who would help get the system up and running quickly. For the devices, City Lifeline chose a combination of Suprema BioEntry Plus and BioLite Net for the flexibility in range and aesthetics, indoor and outdoor certification as well as multi-factor authentication capabilities (fingerprint, card and PIN) which made it easier to address all the access control desires of particular personnel -- clients, visitors and staff (both permanent and contracted). Entertech Systems provides intelligent identity management solutions which aim to remove the three main obstacles to mainstream adoption of biometrics: cost, complexity and on-boarding users. As a partner of Suprema, the premier provider of next-generation IP access control and the global leader in biometric access control systems they offer the full suite of the top-rated Suprema biometric products and applications as well as support and training resources. Their BioConnect identity management platform enables Suprema readers to be quickly and easily integrated with leading access control systems and considers the growth in biometric technology. For more information, visit http://www.EntertechSystems.com.